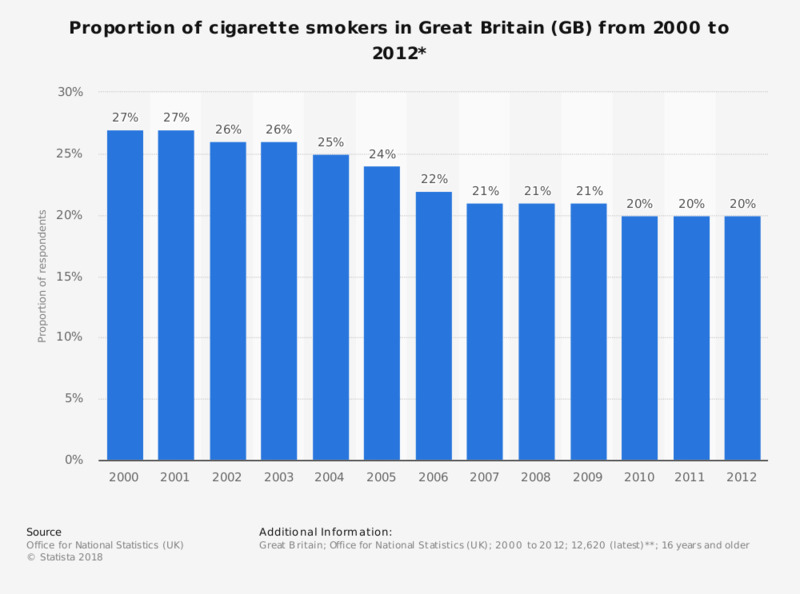 This statistic shows the proportion of cigarette smokers in Great Britain from 2000 to 2012 (as a percentage of population). Over this thirteen year period, the amount of smokers among the population decreased by 7 percent. In the most recent years this fall slowed, remaining at 21 percent from 2007 to 2008 before decreasing again by 1 percent for the most recent three year period. 2005 data includes last quarter of 2004/05 data due to survey change from financial year to calendar year. Results from 2006 onwards include longitudinal data (see the GLF 2011 Technical Appendix B - Sample design and Response). ** Unweighted sample size is rounded to the nearest 10.